Contact The Iron Shop to discuss particulars. Download and submit the PDF ordering form. Once you receive and approve a quote from The Iron Shop, submit a 50% deposit. Full size shop drawings will be generated and sent for approval. Sign the drawings and send photographs of the signatures back to The Iron Shop. After signatures and remaining payment are received, allow 3–4 weeks for delivery. Note: posts are not included in your order. Please enter your name before continuing. Please enter a valid email before continuing. Please enter a zip code before continuing. Please select a country before continuing. Please enter your inquiry before continuing. Offered in three matte finishes: Charcoal Black, Bronze or Classic White. Structural aluminum guardrails curve with the deck. Powder-coated finish resists impact, fading and protects against the elements. Sleek, sturdy balusters match the crisp edges of the rails. Available in two heights: 36" and 42". 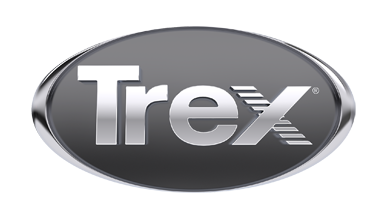 Backed by the Trex 25-year limited warranty. Which measurements are required to order Trex® Signature™ Curved Railing? You will need two measurements: the total length of your curved section(s) measured as a straight line between the posts, and the offset from that center line to the inside edge of the curve. While it is possible to measure from drawings, the frame of a deck often does not match the drawings perfectly. It's best to measure the actual deck frame. Once you approve the full-size prints, you are responsible for the accuracy of the measurements. Your order includes top rails, bottom rails, balusters and swivel brackets (including hardware). Posts are NOT included. How difficult is Trex® Signature™ Curved Railing to install? Installation is very straightforward. It’s a one-piece design, so there is no middle baluster to fasten between the rails. To attach the rail to the top bracket, remove the small insert on the underside of the bracket and screw from the bottom up into the rail. For the bottom rail, simply place the screw into the tab. If the baluster is too close to the post to use a drill, you can remove a small section of the top rail and screw down into the bracket. For the bottom bracket, a small dab of silicone will prevent rattle and ensure a secure installation. How long does it take to receive the custom rails? Once print approval and payments are received, allow 3-4 weeks for delivery. Shipping is free anywhere in the continental U.S. Please note that Canada and international shipments will incur additional charges.